The Magic Johnson Foundation/ Taylor Michaels Scholarship Program (TMSP) offers scholarships to minority high school students who plan to attend a four-year college. Eligible students must be American Indian Alaska Native, Asian/Pacific Islander, Black or Hispanic. They must also be residents of Atlanta, Lansing, Detroit, Cleveland, Chicago, Houston, New York and Los Angeles County. Students must have a grade point average of 2.5 or above and must also be active in community service. They must plan to enroll full-time at an accredited college or university. Eligible students need to demonstrate financial need and social-economic challenges that might otherwise prevent them from pursuing a college education. Both U.S.and non-U.S. citizens may apply. The scholarship is funded by the Magic Johnson Foundation, a non-profit organization established in 1991 by Magic Johnson to support educational, health and social needs of minorities in urban communities. The Taylor Michaels Scholarship Program was founded in 1998 and named after the former Chief Operating Officer for Magic Johnson Enterprises. 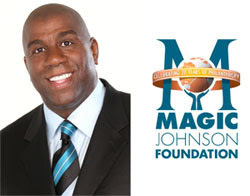 Since 1998, the Magic Johnson Foundation has enabled 386 students to attend college. The foundation also serves the needs of disadvantaged youth through a network of Community Empowerment Centers (CEC's) that finance programs for youth such as online learning scholarships, technology boot camps, and grants for hardware and software.